Stinson Beach is one of northern California's most popular beaches, conveniently located just off CA Hwy 1 about 20 miles north of San Francisco in the town of Stinson Beach. The wide, clean stretch of sand runs for almost 3 miles and you'll find lots of things to do. It may also be one of the area's busiest beaches, with all of its many parking spots filling up on any weekend when the weather is warm. 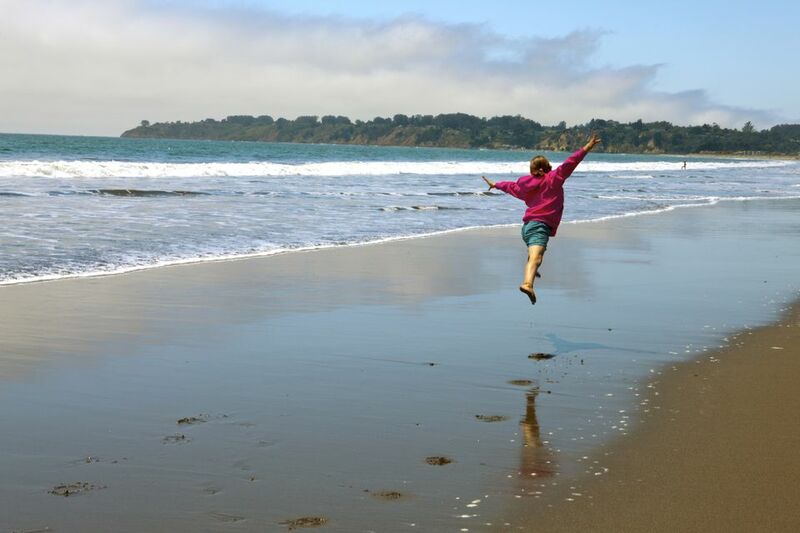 What Is There to Do at Stinson Beach? At Stinson Beach, you can go surfing or swimming, A lifeguard is on duty late May to mid-September. Posted signs warn about rip tides and strong currents. Take care when swimming and don't go alone. Just so you know, great white shark attacks have occurred at Stinson Beach. Stinson Beach Surf and Kayak, nearby on Hwy 1 rents boards, wetsuits, kayaks, and bicycles. You'll find lots of picnic tables, including some big ones that are good for groups. No fires or grills are allowed on the beach, but you'll find barbecue grills in the picnic area. As nice as all that sounds, don't imagine yourself grilling a burger while watching the waves - a row of trees and shrubs separates the picnic and parking areas from the beach itself. You can also find places to eat nearby. The Parkside Snack Bar is just across from the parking lot and a snack bar at the base of the main lifeguard tower is open in summer. You can also walk just a short distance into town. You'll find two large public restrooms at Stinson - and cold-water showers to help get some of the sand and salt off. Pets are not allowed on the sand, but they are OK in the parking lot and picnic area. Water quality is generally good at Stinson Beach, but in case you're concerned, you can check the latest water quality warnings online. Glass containers are not allowed on the beach. Bring your drinks in plastic or bring plastic containers to transfer into when you arrive. Alcohol is allowed if you're over 21 years old. Some people like to bring a small tent to set up on the beach, to get out of the sun when they need to. Stinson isn't the only beach in Marin County. To find one that's just right for you, check the guide to Marin County's Best Beaches. You can also find some Clothing Optional Beaches in Marin County. Take CA Hwy 1 all the way, exiting US 101 onto Hwy 1 just a few miles north of the bridge. It's a scenic drive, but over winding roads. The section of Hwy 1 south of Stinson is full of sharp curves, has sharp dropoffs - and in some places, there are no guard rails. Vehicles over 35 feet long are not advised on this route. Take the same exit, but turn right from Hwy 1 onto Panoramic Highway, which is an inland route that bypasses the worst part of Hwy 1. No matter how you get there, the Stinson Beach entrance is between CA Hwy 1 mile markers 12.5 and 13.0, on the north edge of town. You can find it by watching the mileage markers if you know how. Find out how to interpret a California milepost marker so you're prepared. Traffic can get really backed up on Highway One during busy times. You may want to catch the West Marin Stagecoach bus in Marin City instead of driving your own vehicle. They stop right at the beach parking lot.